High non-wage labour costs, high taxes, and excessive bureaucratic obligations – these are the obstacles considered most harmful for running a company in Poland. These are the conclusions from a survey conducted by Maison & Partners on behalf of the Union of Entrepreneurs and Employers. It ought to be emphasised that the survey beginning with this edition is carried out on a different business base (previously the database of the Union of Entrepreneurs and Employers, presently of the Ariadna National Research Panel). The sample structure in terms of the size of the companies surveyed in this measurement and the previous ones does not differ, but the demographic structure of respondents has changed considerably. This change may be to a large extent the effect of methodological modification and not of actual differences in the perception of barriers in recent years by Polish entrepreneurs. Maison & Partners for the Union of Entrepreneurs and Employers, January 2019, N: 733, survey conducted among a group of the SME sector companies representative in terms of workforce size (up to 250 employees). The most commonplace barriers are a much bigger problem for microenterprises than companies with a larger workforce, as well as for enterprises from the services sector than those from trade and production. Entrepreneurs arranged the above barriers, pointing out those they considered most challenging in terms of running a business. 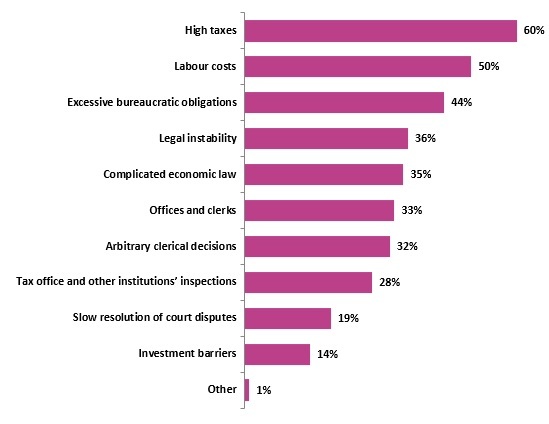 On the TOP2 barriers list, there are high taxes (57%) and labour costs (52%). According to the presented data, 88% of respondents consider unclear legal provisions as a definitely essential barrier to the development of enterprises in Poland. Subsequently, administrative requirements (87% of respondents) and lack of financial resources (86% of respondents) are considered equally harmful in this respect. 64% of people asked about the most important reasons for not employing more people in small- and medium-sized enterprises pointed to the lack of financial resources, for example, too high employment costs. Too low profits caused by the lack of financial resources are also a major obstacle for small- and medium-sized enterprises to invest their capital. As many as 48% of respondents say so. Lack of financial resources is also perceived as the biggest obstacle at the start – almost half of Polish entrepreneurs (47%) believe that the lack of money is the main barrier to starting their own business. Due to the fact that the above-mentioned lack of financial resources is considered by entrepreneurs to be the greatest obstacle to starting their own business, it is the state’s financial aid according to entrepreneurs (53%) that could encourage them to establishment their own businesses. Another important incentive would be an extended payment period of the preferential social security premium according to 43% of respondents. “I would recommend the government to have a good look at this study instead of inventing ‘entrepreneur’s tests’ and limiting the possibility of making use of the flat tax rate when self-employed. Improving the business environment will serve everyone and I can guarantee that the state budget would quickly feel the results thereof,” concludes Cezary Kaźmierczak.